Not only is there an incentive for the spousal support payer, but the receiver of the spousal support also has an incentive to end the marriage before the New Year. Judges are expected to start awarding smaller spousal support payments next year due to these new tax laws. Although relatively uncommon, according to the Internal Revenue Service, around 600,000 taxpayers in the United States claim the spousal support deduction each year. Starting in 2019, it is anticipated that Judges will begin awarding smaller spousal support payments because those paying spousal support will now have less income available to support their ex-spouse due to the new tax laws. Under the current law, spousal support payments are taxed. However, they will not be taxed starting in 2019. This means receivers of spousal support will receive a larger payment that will be taxed if the divorce was finalized in 2018, versus a smaller amount that won’t be taxed if the divorce is finalized in 2019. Spouses can accept property or a share of their spouse’s retirement savings instead of spousal support. Keep in mind, a divorce in California cannot be completed until at least 6 months after proceedings begin. This means that only divorces filed before June 30th are eligible to beat the December 31st, 2018 deadline. The new tax laws are expected to cause complications in divorces, especially among high-income earners. The new tax laws will not only affect spousal support, and in many aspects it is still unclear how the impending tax laws will affect divorcing couples. Do you need help understanding the new laws, and the implications they may have on your divorce, legal separation or paternity case? 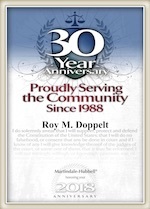 The divorce lawyers at The Law Offices of Doppelt and Forney are here to help. Call us today at (858) 312-8500 to set up a free consultation with one of our experienced San Diego divorce lawyers. We serve clients throughout San Diego County, including clients residing in Chula Vista, Carlsbad, Coronado, La Mesa, Vista, La Jolla, Del Mar, Ramona, Oceanside, Point Loma and other nearby municipalities.